This news story was published on March 22, 2019. 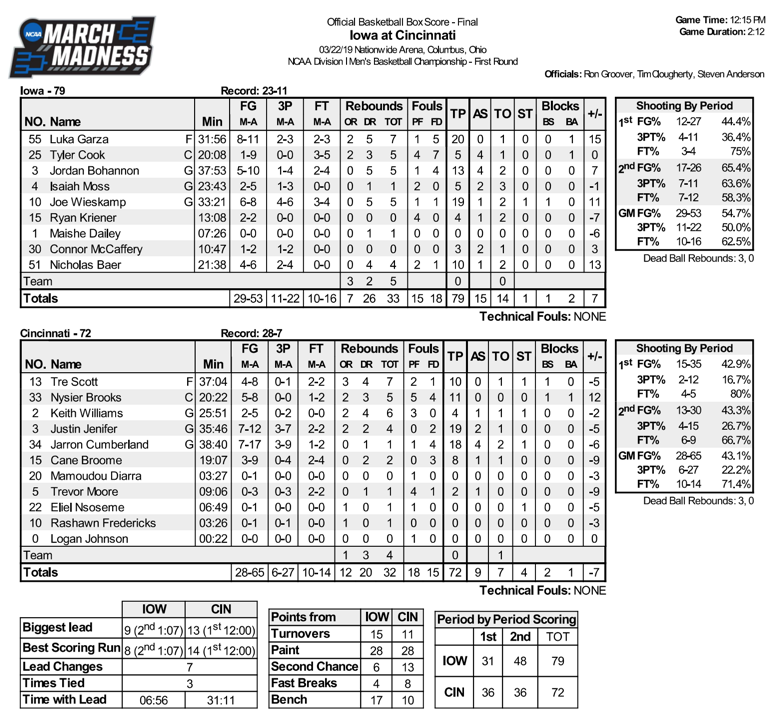 COLUMBUS, OHIO – The Iowa Hawkeyes fell behind early but stormed back int he second half to beat the Cincinnati Bearcats in a first round NCAA Tournament game Friday. Luka Garza led Iowa in scoring, netting 20 points. The sophomore center has scored 20 points or more two of Iowa’s last four games. Freshman Joe Wieskamp scored 19 points in his first NCAA Tournament contest as a Hawkeye. The Hawkeyes made 11 three-pointers today versus Cincinnati (11-of-22, .500). Iowa improved to 10-2 this season when making 10 or more triples. Today’s victory over Cincinnati was Iowa’s fifth over a nationally-ranked opponent this season. Iowa handed Cincinnati its first loss of the season when leading at halftime (23-1). Iowa have won its last three NCAA Tournament first round games, dating back to 2015. 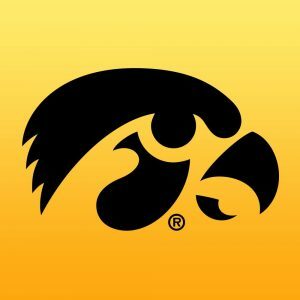 Today marked the 26th NCAA Tournament appearance for the Iowa Hawkeyes. Iowa improved to 5-1 in neutral site games this season. Iowa advances to the second round of the NCAA Tournament to face the #2 seed Tennessee on Sunday. THE MODERATOR: We’re joined by Iowa head coach Fran McCaffery and student-athletes Jordan Bohannon and Luka Garza. Questions. Q. When you were down 11 fairly early in the first half I think it was, what did you think was the feeling of your team and was there anything you wanted to accomplish personally to get your guys in a different mindset, because you ended up in a different mindset? LUKA GARZA: I think the timeouts in that stretch when it was 18-5, those were key. And everyone was communicating. It was a great feeling in the timeout. We knew a couple of shots we missed. We missed a couple of chippies around the rim, and we needed to get back and get some stops and rebound. They started to get too many offensive rebounds. As a group individually I wanted to get inside and post up more and post deeper. I thought in the beginning some of those guys were pushing me out of the spots I wanted to get to. I think I did a better job of that through the course of the game to get deeper because it’s easy for them to come double or poke me when I’m posting up 17 feet away. I tried to do a better job of that I thought as a collective group we all tried to focus and string together some shots. Q. Would you both care to discuss the impact your zone had on them? JORDAN BOHANNON: I think we did a good job of just kind of getting them a little hesitant. They’re a really well-coached team and run a deliberate offense. We knew that coming in. We started out man to start out the game and they got a couple of easy baskets. We changed it up a little bit. I thought our press was really great tonight. They didn’t know when to go or not to go. So we did a really good job changing the pace of the game controlling the tempo especially in the second half. LUKA GARZA: I thought we were communicating. They have terrific shooters in Jenifer and Cumberland. And they were trying to run Jenifer to the corners and try to get him some open looks. He hit a couple early when he was wide open. We tried to key in on that, and we did a great job just moving around, just making those shots tough for them. Q. What did you do to regroup after the tough stretch to end the regular season? JORDAN BOHANNON: We worked really hard. It wasn’t a lot of fun during that stretch. We played really well in the beginning of the season, middle of the season. That’s life in the Big Ten. That’s why we got eight teams in the NCAA Tournament. I don’t think we’ve lost a game in the NCAA Tournament as well. That shows how powerful and strong this conference was. So a lot of it was just playing really good teams. And we knew that. And it prepared us to get ready for the NCAA Tournament. LUKA GARZA: We just needed to stay confident with each other. We know what we’re capable of. We keep saying that but it’s true. We know what we can do when we play at our best. And it was great to see tonight even when they got up we stayed composed and were able to get to play better. Q. Jordan, I’d like to ask you, what is it like for you guys to lean on Luka in those tough situations? JORDAN BOHANNON: It’s really easy to. He’s come up big in a lot of games this year. He was dominant down low tonight, or this morning, I guess. And we know if we fed him the ball down low he was either going to get an easy basket, draw a foul or kick it out. I thought he did a really good job of doing all those three things when he did end up getting the ball. Q. You point for the tournament, you look up and it’s 18-5. What do you say to them at that point? COACH MCCAFFERY: I think the most simple approach is — the most logical one is it was 35 minutes to go. So no time to panic. It could have easily been we were up and we have to keep playing well. So we made some adjustments. We changed the defense. We changed some personnel a little bit. You start pushing some different buttons. But I think the critical thing is that the players maintained confidence. You don’t start screaming and yelling at them, blaming them because they didn’t rotate and block out. We talked about blockout; they had nine offensive rebounds in the first half for 11 points. If I’m spazzing and yelling at everybody for that they’re not going to lock in on what we need to do with offense, what defense are we in, who is on the floor for them, where is Cumberland, who do we need to get the ball to. So you just try to stay very business-like. Plenty of time, we’re going to continue to do what we do. Maybe call a different offensive set or alignment, give them a little bit of a different look, because when you’re matching up this is what they do so well. They’re pretty good at it. So if you stand and you kind of run similar action, they’re going to lock you up. So you’ve got to have more ball movement, more people movement, more movement with a purpose to get better shots. And then we just needed to see it go in a little bit there. Thankfully Isaiah made two early because we were really struggling. It was the five that you’re talking about, but eventually Luka got going. I put TC back in after he had two fouls. He made a couple of buckets. And Joe got a big one. We just sort of settled down. Then you felt like, okay, we can attack this thing successfully. Q. Did you play a lot of zone this year? Q. Why in your mind did it work so well today? COACH MCCAFFERY: Well, sometimes you play zone because you think a zone will work against a particular team. Sometimes you play zone to change up what wasn’t working. A man wasn’t working. We felt like we could mix our pressure three-quarter court. We played a couple different ways and then our half-court zones which we play a couple different ways. So that would, at the very minimum, keep them in front of us so we could see where they are. You’re not guarding as much action. You can sort of surround a painted area on a missed shot, helps you rebound. Some coaches would argue that it doesn’t help you rebound. I think it does. Keeps everybody there. And it put more pressure on them to shoot 3s. They’re a team that’s pretty good at it. But tonight they were 6-for-27. Q. How much time do you spend this week coming into today that it might feel more like a true road game being so close to Cincinnati? COACH MCCAFFERY: Truthfully, not very much. The thing about NCAA Tournament play, there’s other teams represented here today that don’t care who wins this game. So the Tennessee people, the Colgate people, they don’t care. I knew the Hawk fans would be doing the “Let’s go, Hawks” cheer. I knew there would be more Cincinnati people. But it’s an NCAA game. I didn’t feel like in any way shape or form it was a road game to me. I coached in ’09; we played Ohio State in Dayton. I remember like it was yesterday and everybody from Louisville was rooting for Siena. So it’s a different kind of deal. Our guys were locked in. Every game in our league is a big stage. It’s national TV. It’s an NBA arena. And we’re used to being on the road. We just played at the United Center. So the critical thing is to know and understand what do we have to do to beat Cincinnati; what do they do well? What can we take away? What can we do to exploit them? And not worry about who’s in the 15th row yelling for one team or another. Q. You never know how a freshman is going to respond. What is it about Wieskamp that made him be able to be so poised? COACH MCCAFFERY: I think the thing that was impressive about him today was it didn’t start real well for him. A lot of times when that happens guys struggle for 40 minutes. He has always done a really good job of figuring out what are they doing to me? What are they doing to us? What can I do that’s different than what I’ve been doing? He’s a very cerebral guy in that sense. And I think as the game progressed, you saw him become more confident in what he was doing at both ends. He gets 19 points. Hits a huge 3. But — huge shot block at a very critical situation. He’s just a guy that does a lot of things to help us win. And you can count on him to make those kinds of decisions in his head and not be a mistake guy. Q. Not that the NCAA Tournament always correctly reflects a league strength, but what does it say about the Big Ten that you’re 6-0 so far in this tournament? COACH MCCAFFERY: We’ve been saying all year long that it’s the most competitive league in the country top to bottom. And you sort of expect Big Ten coaches to make those kinds of statements. But the reality is we actually believe that. And so I think it’s proving it. Q. What you said before about keeping your poise on — you’re a hot-blooded guy, a Philly guy? Q. — was there a point in your career where you learned how valuable it was to keep your poise under those kinds of circumstances, 18-5, that kind of thing? COACH MCCAFFERY: Very definitely. One of my mentors, John MacLeod, he was the best at that. And he would always say, when it gets sticky, you can’t yell at them. That’s what he would say. So when you see me get hot blooded, there are various reasons for that, and it happens despite what some people might think, very rarely. It doesn’t happen very much in practice. It doesn’t happen much in the locker room, at halftime. Oh, that coach went in there and yelled at them. No. But at crunch time and in key moments of the game, you can’t lose your mind and start yelling at them. It’s only going to lead to more mistakes. At that point you need to build confidence. Q. Three big scores in the second half underneath out-of-bounds, two of them from out of a timeout — a Garza 3, a Baer 3, and then you get a Garza layup. Those go-to sets for you guys out of bounds or did that come out of the timeouts? COACH MCCAFFERY: They’re go-to sets for us. But the difference is you can run certain action. But then you can move people around in that action. So it might look different. So we ran a typically action but we moved things around. And that’s how Luka got the 3 in particular. He’s not usually in that spot, usually a guard or a perimeter guard.